Riverside: Essential reading for music lovers everywhere! 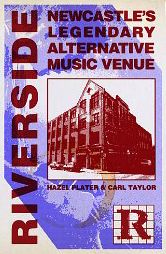 ‘Riverside: Newcastle’s Legendary Alternative Music Venue‘ is a must-read for anyone who has ever been to a gig, been in a band (or dreamt of being in one) or has any interest, love or passion for the music industry. Lovingly compiled by former employee Hazel Plater and fanzine writer/avid gig-goer Carl Taylor, the book takes you through the entire history of the club from inception to closure and is filled with first hand accounts and anecdotes from the people who worked there, the punters and the fantastic bands and DJs who played there too. Until the Riverside opened its doors in 1985, Newcastle was usually overlooked by touring bands, but it soon established itself as one of Britain’s best live music venues with practically every great band and DJ from the 80’s through to the late 90’s playing there, including Nirvana in their first ever European gig! Not only was the Riverside a great live music venue, but it was also the home of the legendary house night ‘Shindig’ which attracted global fame to the club. For 20yrs, the Riverside WAS the epicentre of the music industry in the region and locals (including myself) owe a great debt to those who came together and made it all happen. Apart from being a fantastic slice of nostalgia for anyone that walked through the doors, this book provides wonderful inspiration for anyone, of any walk of life, demonstrating what incredible things can happen when you dare to think big. Buy this book now! You need it on your shelf!